NIOSH Death in the Line of Duty reports generally contain two types of recommendations, those that focus on specific contributory factors and others that address general good practice. As when examining contributory factors, it is important to read the NIOSH recommendations critically. Do you agree or disagree and why? What would you change and what additional recommendations would you make based on the information presented in the report? 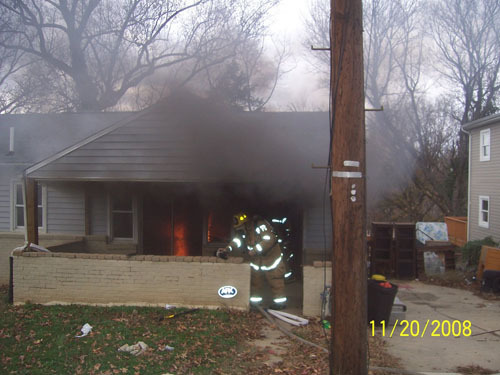 NIOSH Report F2008-06 examines a fire in a wood frame duplex that resulted in injury to Lieutenant Scott King and the death of Firefighter Brad Holmes of the Pine Township Engine Company. 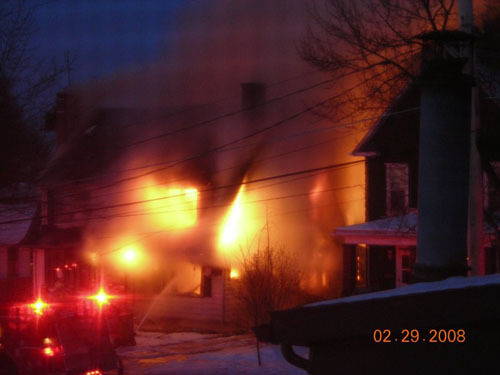 The fire occurred on February 29, 2008 in Grove City, Pennsylvania. When the fire department arrived, the unit on Side D was substantially involved and a female occupant was reported trapped in the building. Initial operations focused on fire control and primary search of Exposure B. Rapid fire development trapped Lieutenant King and Firefighter Holmes while they were searching Floor 2 of Exposure B. The following photographs are part of a series of 37 pictures taken during this incident and provided to NIOSH investigators during their investigation. Additional detail on this incident is provided in Developing & Using Case Studies: Pennsylvania Duplex Fire Line of Duty Death (LODD) and Pennsylvania Duplex Fire: Firefighting & Firefighter Rescue Operations . In addition, readers should review NIOSH Report F2008-06 . NIOSH Report F2008-06 contains 11 recommendations. Several of these recommendations are well grounded in the contributory factors identified in the report. Others have a more indirect relationship to the factors influencing the injury to Lieutenant King and death of Firefighter Holmes. Recommendation #1: Fire departments should be prepared to use alternative water supplies during cold temperatures in areas where hydrants are prone to freezing. In preparation for potential issues, fire departments should develop standard operating procedures (SOPs) for temporary water sources to be dispatched like tankers, water shuttles, or portable drop tanks. While this recommendation is valid and good practice, it has little to do with loss of water as a contributory and likely causal factor in the injury to Lieutenant King and death of Firefighter Holmes. Had Command been notified immediately of the frozen hydrant and implemented alternate water supply strategies, the outcome would have likely been the same if tank water had been used as it was in this incident to sustain initial operations. However, it is critical for fire departments to have a plan to respond to respond to water supply problems. In this case, apparatus had substantial tank water which was used to support initial firefighting operations. In addition, there was sufficient hose available on first alarm companies to stretch to other hydrants (such as the one eventually used east of Garden Avenue on Craig Street). Use of a reverse lay to establish water supply allows the apparatus operator to continue the lay to the next hydrant (hose capacity permitting) or another apparatus to continue the lay and establish a relay. Depending on the distance to the next operational water source, this could be considerably more efficient and rapid than waiting for greater alarm resources to establish a tender shuttle. Recommendation #2: Fire departments should ensure that search and rescue crews advance or are protected with a charged hoseline. This recommendation is critical. However, the discussion fails to speak to the need for backup lines to protect the means of egress when crews are working above the fire. 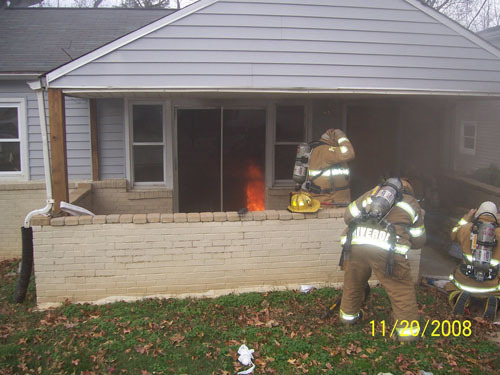 Recent incidents in Loudoun County, Virginia and Sacramento California, resulted in crews with a hoseline working above the fire without a backup line having their hose burn through, and means of egress cut off, necessitating emergency egress via second floor windows. Recommendation #3: Fire departments should ensure fire fighters are trained in the tactics of a defensive search. While training in search under marginal circumstances is important, this recommendation fails to speak to the need to understand fire behavior and applied fire dynamics as a foundation for maintaining situational awareness on the fireground. This applies to command personnel, company officers, and individual firefighters. While there are a number of points in the sequence of events that lead to Lieutenant King’s injury and Firefighter Holmes’s death, all are dependent on this. Failure to recognize the potential for extension and rapid fire progress, the influence of creating ventilation openings on Floor 2, and recognition of developing fire conditions were likely the most significant causal factor in this incident. Had this not been the case, the firefighters and officers involved would have had the opportunity to adjust their tactical operations or exit the building prior to the occurrence of the extreme fire behavior that trapped the search team. There are two warning signs that may precede flashover: heat mixed with smoke and rollover. When heat mixes with smoke, it forces a fire fighter to crouch down on his hands and knees… As mentioned above, rollover presages flashover. This statement is scientifically incorrect. Heat is simply energy in transit due to temperature difference. It is not a substance and cannot mix with anything else. Increasing temperature is an indicator of potential for flashover, but perception of a rapid increase in temperature is not certain to give adequate warning to take corrective action or escape from the hazardous situation. In addition, rollover does not always precede flashover (it is an important indicator, but only one of many). The report also quotes Chief Dunn regarding defensive search tactics. At a door to a burning room that may flashover, fire fighters should check behind the door to the room and sweep the floor near the doorway. Fire fighters should not enter the room until a hose line is in position. When there is a danger of flashover, fire fighters should not go beyond the “point of no return.” The point of no return is the maximum distance that a fully equipped fire fighter can crawl inside a superheated, smoke-filled room and still escape alive if a flashover occurs. The point of no return is approximately five feet inside a doorway or window. When searching from a ladder tip placed at a window, look for signs of rollover if one of the panes has been broken. If rollover is present, do not go through the window. Instead, crouch below the heat and sweep the interior area below the windowsill with a tool. If a victim has collapsed there, you may be able to crouch below the heat enough to pull him to safety. While these tactics have validity, making for search without without protection of a hoseline even to Chief Dunn’s “point of no return”� presents a significant risk. Further, I am uncertain that there is any scientific evidence supporting the concept of the point of no return as described by Chief Dunn. There are numerous examples of situations where firefighters thought they had time to complete a search, but were trapped by extremely rapid fire development. The risk of searching under marginal conditions requires firefighters to effectively read the fire and mitigate hazards in the fire environment through effective use of gas cooling and control of the ventilation profile (either tactical ventilation or anti-ventilation as appropriate) and establishing fire control in addition to primary search. Recommendation #4: Fire departments should ensure that fire fighters conducting an interior search have a thermal imaging camera. The thermal imaging camera is a tremendous technological innovation which can significantly speed search operations and provide visual indication of differences in thermal conditions. However, implementation of this recommendation would not necessarily have impacted on the outcome of this incident. Recommendation #5: Fire departments should ensure ventilation is coordinated with interior fireground operations. This statement is not always true. The influence of ventilation on fire development is dependent on burning regime (fuel or ventilation controlled) and the location of the inlet and exhaust openings. Heat release rate from a ventilation controlled fire will increase as ventilation is increased, potentially taking the fire to flashover (rather than the reverse as indicated by the statement in this NIOSH report). In addition, creation of an air track that channels the spread of hot gases and flames to additional fuel packages can result in fire extension and subsequent flashover. Both of these factors were likely to have been significant in this incident. Coordination of ventilation and search or ventilation and fire attack (as frequently stated in NIOSH reports related to incidents involving extreme fire behavior) requires knowledge of fire dynamics and the influence of ventilation in fire behavior. Recommendation #6: Fire departments should ensure that Mayday protocols are developed and followed. This recommendation is important, but fails to address other individual level survival skills that must be integrated with these procedures. For example, in this incident, the Lieutenant and Firefighter might have been able to take refuge in one of the bedrooms, closing the door to provide a barrier to hot gases and flames. A ladder was initially placed to a window in the bedroom on Side B (in close proximity to the location where Firefighter Holmes was found). Ladders were subsequently placed to the bedroom windows on Side A. While it may have been difficult to accomplish this under conditions of extreme thermal insult, if developing conditions had been recognized soon enough (see my earlier observation on situational awareness), this may have bought critical seconds and allowed the trapped search team to escape or be rescued. Recommendation #7: Fire departments should ensure that the Incident Commander receives pertinent information during the size-up (i.e., type of structure, number of occupants in the structure, etc.) from occupants on scene and that information is relayed to crews upon arrival. Had the Incident Commander received more specific information from the occupants or law enforcement, this may have shifted focus in search operations as survivability in the original fire unit was doubtful. Despite this, the civilian casualty was later located outside the fire unit, behind the door in the front foyer that served both dwelling units. Recommendation #8: Fire departments should ensure that fire fighters communicate interior conditions and progress reports to the Incident Commander. This is a key element in maintaining situational awareness (on the part of the Incident Commander). However, it is equally important for Command to communicate with interior crews regarding conditions observed from the exterior or situations (such as water supply limitations) that will impact interior operations. Recommendation #9: Fire departments should develop, implement, and enforce written standard operating procedures (SOPs) for fireground operations. This recommendation focuses on general good practice, but is not tied to specific contributing factors related to the injuries and fatality that resulted in this incident. This type of recommendation should likely be included, but placed in a separate section so as not to dilute the focus on lessons learned. Recommendation #10: Fire departments and municipalities should ensure that local citizens are provided with information on fire prevention and the need to report emergency situations as soon as possible to the proper authorities. Recommendation #11: Building owners and occupants should install smoke detectors and ensure that they are operating properly. If implemented prior to this incident, Recommendations #10 and #11 would likely have had a positive impact on its outcome, particularly with regards to the civilian casualty and the severity of conditions encountered by the firefighters. However, these two recommendations do not go far enough. Citizens must also recognize the need for rapid egress and the value of closing doors to confine the fire and limit inlet of air required for continued fire development and increasing heat release rate. CFBT-US has developed a detailed case study based on this incident and the data contained in NIOSH Report F2008-06 . Download the Grove City, Pennsylvania Residential (Duplex) Fire Case Study in PDF format. Over the last two weeks we have spent considerable time with a NIOSH Report F2008-06 . NIOSH has completed 335 investigations during the first 8 years that this program has been in existence. 49 more investigations are pending. The information contained in these reports provides a vast reservoir of data that can be used to deepen understanding of your craft and improve decision-making and risk management skills. Make a commitment to developing your expertise as a firefighter or fire officer in the new year and for the rest of your life. Look for the this logo (more information to follow)! I would like to extend my thanks to Steve Berardinelli and Tim Merinar of the NIOSH Firefighter Fatality Investigation and Prevention Program for their assistance in developing the Case Study based on NIOSH Report F2008-06. Just prior to my first post regarding this incident, I forwarded a request for additional information to the NIOSH staff and received a quick response from Tim that he would forward my request to the investigators. This morning I had an excellent conversation with Steve and obtained additional information that was extremely helpful in refining the case. I will be revising Developing & Using Case Studies: Pennsylvania Duplex Fire Line of Duty Death (LODD) and Pennsylvania Duplex Fire: Firefighting & Firefighter Rescue Operations based on additional information provided by NIOSH. Changes include addition of information related to the ventilation profile, initial fire conditions, and occupant actions. It is important to note that the observations in this post regarding the contributory factors identified in NIOSH Report F2008-06 are made as a critical friend. Most firefighters and fire officers who read this (or any) NIOSH report will agree with some of the recommendations, may disagree with others, and undoubtedly would make additional recommendations based on their individual assessment of the incident. Analysis of contributing factors and recommendations (rather than simply accepting them) is an important element in the learning process. Dig a bit deeper and build an understanding of why events may have unfolded the way that they did. Identify the critical points at which the outcome could have been changed (there are likely more than one). Think about how these recommendations might apply to you and your department. As discussed in my earlier post; Criticism Versus Critical Thinking, the intent of this analysis and critique is to share what I have learned from this case, with all due respect to those involved. The firefighters and fire officers involved in this incident were faced with a difficult situation to begin with, having an occupant reported trapped in the building. This was compounded by challenging water supply problems due to multiple frozen hydrants. It is far easier to examine incident information in a comfortable environment with no time pressure than to deal with these issues in the cold, early morning hours. My original intent was to examine both the contributory factors and recommendations in NIOSH Report F2008-06. However, due to length, this critique will be divided into two separate posts. 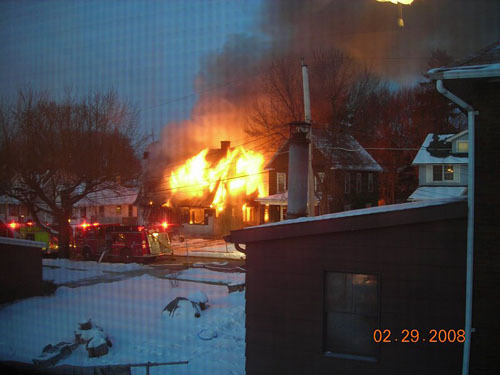 On February 29, 2008 The Grove City Fire Department, Pine Township Engine Company, and East End Fire Department responded to a fire in a two-story, wood frame duplex in Grove City, Pennsylvania. Initial dispatch information and the initial size-up indicated that a female occupant was trapped in the building. When the Chief and first engine company arrived, the unit on Side D was substantially involved with smoke in the unit on Side B. Several hoselines were placed into operation for fire control, but fire conditions precluded an offensive attack in the involved unit. Pine Township Engine 85 was assigned to search and rescue of the trapped occupant. Firefighter Brad Holmes and Lieutenant Scott King were tasked with primary search of Exposure Delta. Firefighting operations were hampered by two frozen hydrants, necessitating support of initial operations using only apparatus tank water while an operable hydrant was located. During their search, water supply was interrupted and rapidly deteriorating conditions trapped the search crew. After being rescued by the Rapid Intervention Team, both members were transported to Pittsburgh’s Mercy Hospital Burn Unit. Firefighter Brad Holmes had burns over 75% of his body, and died from his injuries on March 5, 2008. Lieutenant King suffered less serious injuries and was treated and released. A 44 year old female occupant of the dwelling also died. 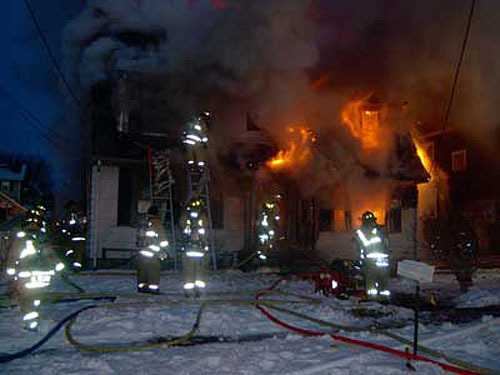 Note: Fire Department Photo – NIOSH Death in the Line of Duty Report F2008-06. This photo likely illustrates conditions after 0635 (approximately 19 minutes after arrival of the first fire unit, Chief 95). Additional detail is provided in Developing & Using Case Studies: Pennsylvania Duplex Fire Line of Duty Death (LODD) and Pennsylvania Duplex Fire: Firefighting & Firefighter Rescue Operations. In addition, readers should review NIOSH Report F2008-06. NIOSH Report F2008-06 identifies seven contributory factors in the injury of Lieutenant King and death of Firefighter Holmes. While each of these factors may have had some influence on the outcome of this incident, this analysis provides insufficient clarity and misses several key factors. Inadequate water supply. 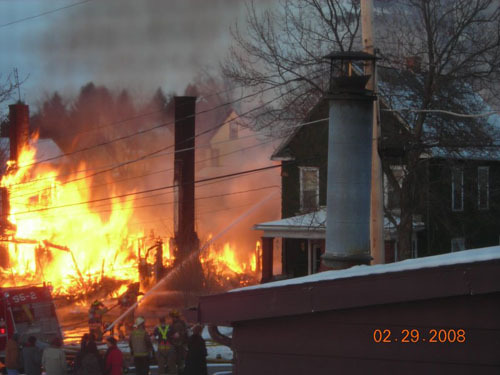 Two hydrants in the vicinity of the burning structure were frozen from the cold weather. The victim and injured Lieutenant did not have the protection of a charged hoseline during their search for the trapped occupant. Inadequate training in defensive search tactics. Non-use of a thermal imaging camera which may have allowed the search and rescue crew to advance more quickly through the structure. Ventilation was not coordinated with the interior search. Size-up information about the structure was not relayed to the interior search crew. The interior crew was searching in the wrong duplex for the trapped occupant and did not realize they were in a duplex. The incident commander was unaware of the search crew’s location in the building. He did not receive any interior reports and was concentrating on resolving water supply issues. Water Supply: The lack of a continuous water supply likely influenced the loss of the structure and loss of water supply to handlines was in all probability a causal factor in the injury of Lieutenant King and death of Firefighter Holmes. However, the volume of tank water available on apparatus that arrived prior to the search team becoming trapped on Floor 2 (5000 gallons) was likely adequate to support search of the uninvolved areas of the building and confine the fire to the unit of origin for the time required to search uninvolved areas of the building. Anticipation that a continuous water supply would be established may have influenced the tactics and water application used by initial arriving companies. Protection of the Search Team: Failure to protect the search team with a hoseline was a significant factor in this incident. However, the outcome would likely have been the same if the search team had a hoseline as fire extended from below to cut off their means of egress. A backup line should also have been in place to protect the search team’s egress while they were working above the fire. There was an additional hoseline initially deployed to the doorway on Side A, however, the position and operation of this line while the search team was on Floor 2 was not specified in the report. Without additional tactical changes, the loss of water supply would have precluded effective hoseline support of search operations. Training in Defensive Search Tactics: Identifying a lack of training in “defensive search tactics” is too narrowly focused. The issue here is significantly broader than stated in the report and should be restated as lack of situational awareness. This causal factor fails to identify the lack of situational awareness on the part of the search crew, the incident commander, and others on the fireground to developing and potential fire conditions and water supply limitations. This lack of situational awareness is likely due to inadequate training in fire behavior and applied fire dynamics (rather than simply inadequate training in defensive search tactics). Use of a TIC: Undoubtedly effective use of a TIC can speed search operations. However the NIOSH report indicated that visibility was not excessively compromised during the initial stages of search on both floors 1 and 2. Reducing the time required to complete the search could have been influenced by use of a TIC, by assigning a separate crew to perform fire control on Floor 1 of Exposure B and allowing Firefighter Holmes and Lieutenant King to focus on primary search or by both of these actions. While technology may useful in improving firefighter safety, it is important to not simply look for a technological solution to a problem which can be substantively related to human factors such as situational awareness, communications, and decision-making. Tactical Ventilation: The location, sequence, and lack of coordination in ventilation was likely a causal factor (along with failure to protect the means of egress with a hoseline and loss of water supply) in the injury to Lieutenant King and death of Firefighter Holmes. Creation of exhaust openings above the fire created a clear path of travel for hot gases and flames from Floor 1 to Floor 2 via the interior stairs and increased air supply to a fire which was likely ventilation controlled (resulting in an increase in heat release rate (HRR) sufficient to result in flashover. This contributory factor also points to the need for training on the influence of tactical operations (particularly ventilation) on fire behavior. Communication of Size-Up Information: Size-up information related to the building and possible victim location could have been a significant factor in focusing the location of the search. However, the civilian occupant was not in either unit, but was located (after fire control) behind the door in the foyer. If it was known that the trapped occupant was from the fire unit, it may have appeared that there was no savable life (due to the extent of fire involvement). But this does not preclude the assumption that she may have been confused and gone into the other unit. Note: There is some difference of opinion between the fire investigator and operational personnel as to the likely location of the victim prior to structural collapse. It is possible that the victim died on Floor 2 of the fire unit and fell to the position where she was found due to structural collapse. 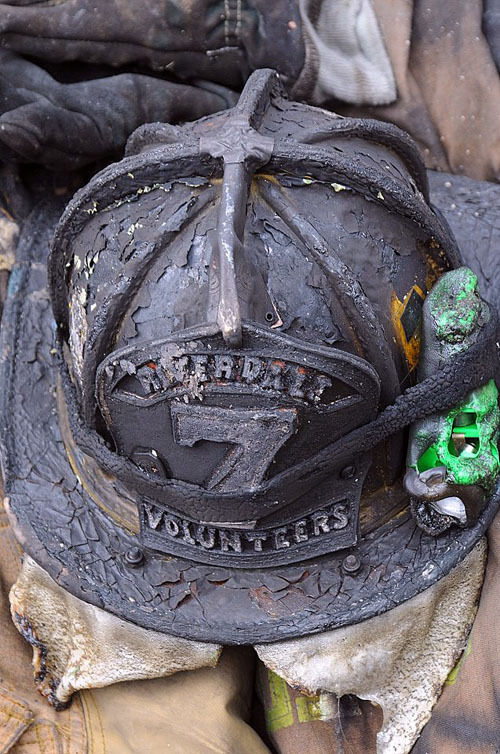 Accountability and Situation Status: Accountability and communication of situation status is critical to the safety of everyone operating on the fireground. Clear communication in advance of the loss of water supply could have influenced the outcome of this incident. When operating off tank water, it is essential to follow a similar philosophy as the Rule of Air Management and retain sufficient water to exit from the hazardous environment. However, it does not appear that the lack of accountability regarding the search team significantly delayed the rescue effort. My next post will examine the recommendations made in NIOSH Report F-2008-06 and will provide a link to a detailed, written case study based on this incident in PDF format. This post continues examination of NIOSH Death in the Line of Duty Report F2008-06. 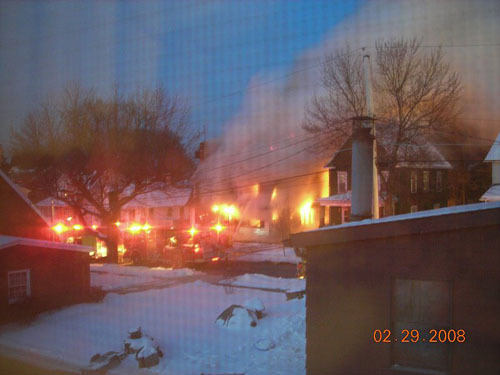 My previous post, Developing & Using Case Studies: Pennsylvania Duplex Fire Line of Duty Death (LODD) emphasized the importance of case studies to individual and organizational learning and presented initial information about the incident which resulted in injury to Lieutenant Scott King and the death of Firefighter Brad Holmes of Pine Township Engine Company. Command assigned Engine 95 (officer and five firefighters) to fire suppression. They deployed a 1-3/4″� (45 mm) line to the door on Side A, but were unable to make entry due to the volume of fire in the involved unit. Engine 95 also deployed a 2-1/2″� (64 mm) handline to the A/D corner. Both lines were immediately placed into operation. NIOSH Report F2008-06 indicated that the 1-3/4″� line stretched to the door on Side A was “unable to make entry due to heavy fire conditions”�. However, exact placement and operation of the 2-1/2” handline was not specified. This line may have been used to protect Exposure D (a wood frame dwelling approximately 20′ from the fire unit), for defensive fire attack through first floor windows, or both. Note: This floor plan is based on data provided in NIOSH Report F2008-06 and is not drawn to scale. Windows shown as open are based on the narrative or photographic evidence. 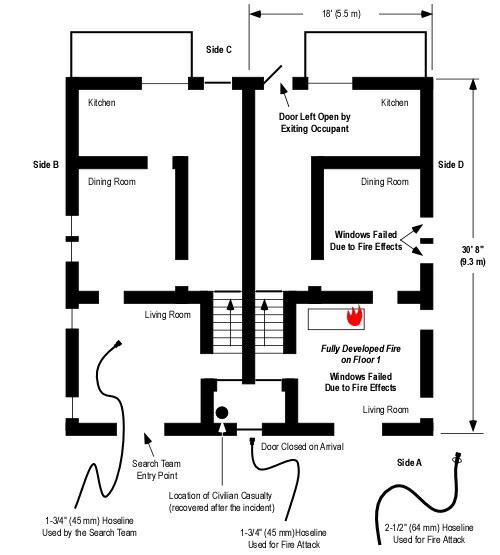 Door position is as shown based on information provided by NIOSH Investigator Steve Berardinelli (this differs from the NIOSH report which includes the fire investigators rough sketch showing all doors open). Windows shown as intact are not visible in the available photographs, but may be open due to fire effects or firefighting operations (particularly those in the fire unit). Second due, Engine 95-2 performed a forward lay from a nearby hydrant and supplied Engine 95 with tank water while waiting for the supply line to be charged. Engine 85 (chief, lieutenant, and three firefighters) was assigned to primary search and rescue of the trapped occupant. Tasked to conduct primary search in Exposure B, Firefighter Holmes and Lieutenant King were performed a 360o reconnaissance prior to making entry. While this was being done other members of the company placed a ladder to a window on Floor 2 Side B (see Figure 3). The NIOSH Report does not specify if the search team was aware of ladder placement. The Officer of Engine 95 vented the window on Floor 1 Side A of Exposure Bravo and observed that the ceiling light was on (indicating that there was limited optical density of the smoke on Floor 1 of the exposure). Firefighter Holmes and Lieutenant King entered through this window (see Figure 2) to conduct primary search of the exposure and observed that the temperature was low and there was limited smoke on Floor 1. Engine 95 passed the search team a 1-3/4″� (45 mm) handline through the window and the search team knocked down visible fire extension and completed their search of the first floor. At this point, Firefighter Holmes and Lieutenant King left the hoseline on Floor 1, went up the stairs to Floor 2 and began a left hand search. Note: See the prior comments regarding windows and door position. The Officer of Engine 95 noticed that the search crew had finished their search on the first floor and were advancing to the second floor. He placed a ladder and broke the window on Floor 2, Side A (See Figure 3). He stated that there was not much heat on the second floor because the plastic insulation on the window was not melted, but he did notice heavy black smoke beginning to bank down. The NIOSH Report did not specify the depth of the hot gas layer (down from the ceiling) or the air track at the window that was vented or Floor 1 openings (windows and door). The hydrant that Engine 95-2 laid in from was frozen as was the hydrant several houses beyond the fire buildingFirst alarm companies used tank water to support initial firefighting operations. The crew from Engine 95-2 began to hand stretch a 3″� line to a working hydrant on a nearby cross street. After Firefighter Holmes and Lieutenant King partially completed their search of Floor 2, Lieutenant King’s air supply was at one half and Firefighter Holmes was unsure of his air status, so the Lieutenant decided to exit. At approximately the same time, Engine 95 ran out of water and the Command ordered companies to abandon the building with Engine 85 sounding its air horn as an audible signal to do so. The Accountability Officer called for a Personnel Accountability Report (PAR), but received no response from Lieutenant King or Firefighter Holmes. Almost immediately after Engine 95 ran out of water, conditions changed rapidly decreasing visibility and increasing temperature on Floor 2 of Exposure B and fire involvement of Floors 1 and 2 of both units. With deteriorating conditions on the second floor, Lieutenant King became disoriented and separated from Firefighter Holmes. He radioed for help at 0638 hours. “Help! Help! Help! I’m trapped on the second floor!” In a second radio transmission, Lieutenant King indicated he was at a window on Side D.
After hearing radio traffic that the search crew could not find their way out and they were by a window the Engine 95 officer accessed a window on Side B Floor 2 (using a ladder previously placed by Engine 85-2). He broke out the window to increase ventilation and attempt contact with the search team. A crew from Engine 77 was tasked as a second search team and preparing for entry when the IC ordered companies to withdraw. However, when they heard the Lieutenant’s call for help, they immediately went to Side D, not seeing the Lieutenant at the window, they continued to Side B. The officer from Engine 77 climbed the ladder they had placed earlier to attempt contact with the initial search team. There was heavy black smoke coming from this window, but no fire. He straddled the window sill attempting to hear any movement, a PASS device, or voices. He banged on the window sill as an audible signal to the search team, but received no response. He also attempted to locate the search team using a TIC, however, it malfunctioned. Flames now pushing out the first floor windows of both the unit originally involved in fire as well as Exposure B. Lieutenant King managed to find his way to the staircase, stumbled down the stairs and out the door on Side A. His protective clothing was severely damaged and smoldering. He collapsed in the front yard and told the other firefighters that the victim was trapped on the second floor. The RIT (R87) made entry supported by a hoseline operated from the entry point by Engine 85-2. 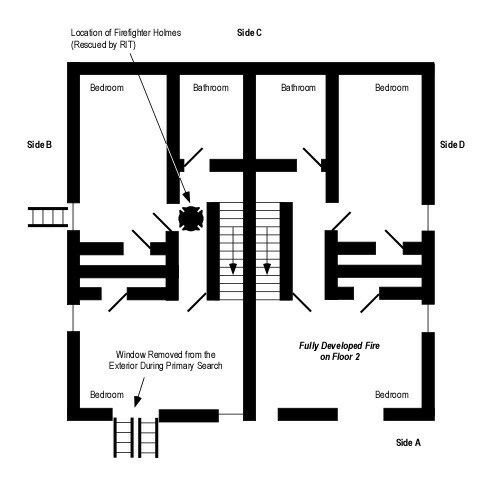 Firefighter Holmes was located approximately 10′ (3 m) from the top of the stairs (as illustrated in Figure 3). He was semi-conscious and on his hands and knees. The RIT removed Firefighter Holmes via the stairway to Side A. Lieutenant King and Firefighter Holmes were transported to a local hospital where they were stabilized prior to transport to the Mercy Hospital’s Burn Unit in Pittsburgh. The following questions provide a basis for examining the second segment of this case study. While limited information is provided in the case, this is similar to an actual incident in that you seldom have all of the information you want. What was the stage of fire development and burning regime in the fire unit when the search team entered the exposure? What Building, Smoke, Air Track, Heat, and Flame (B-SAHF) indictors can be observed in Figure 1? What was the stage of fire development and burning regime in Exposure B when the search team entered? What type of extreme fire behavior event occurred in the exposure, trapping Firefighter Holmes and Lieutenant King? What leads you to this conclusion? What were the likely causal and contributing factors that resulted in occurrence of the extreme fire behavior that entrapped the Firefighter Holmes and Lieutenant King? What self-protection actions might the search team have taken once conditions on Floor 2 of Exposure B began to become untenable? What action could have been taken to reduce the potential for extreme fire behavior and maintain tenable conditions in Exposure B during primary search operations? What factors may have influenced the limited effectiveness of the 1-3/4” and 2-1/2” attack lines deployed by Engine 95? What tactical options might have improved the effectiveness of fire control operations given the available water supply? My next post will examine the contributing factors and recommendations made in NIOSH Death in the Line of Duty Report F2008-06 and will include a link to a more detailed written case study of this incident in PDF format. The National Institute for Occupational Safety and Health (NIOSH) recently released Death in the Line of Duty Report F2008-06 on an incident that occurred in February 2008 in Grove City, Pennsylvania. As I read through the narrative and recommendations I began to ask myself how other firefighters and fire officers might use these reports and how much time they would spend engaged with a particular case. Talking with a number of colleagues, we came to the conclusion that many people would read the summary and recommendations and quickly skim through the detailed information to get a sense of what happened. A smaller number of firefighters and fire officers would really dig into the report to identify lessons learned that go beyond or differ from the NIOSH recommendations. Developing, teaching, and learning using case studies can be an effective element in deliberate practice (see Outstanding Performance). However, as published NIOSH Death in the Line of Duty reports are not necessarily effective case studies. In most cases, reports involving traumatic fatalities need additional clarification or detail and recommendations may need to be removed or at least separated from the description of the incident. When using a case study, it is essential to have the learners make sense of what happened and develop their own conclusions. However, it is often useful to follow this process with a detailed examination of the NIOSH recommendations to determine points of agreement and disagreement and engage in discussion of why. I have started developing a case study using NIOSH Report F2008-06. Over the last two weeks, I have invested roughly 35 hours in this process (not completely finished). Development has included producing a comprehensive timeline based on data provided in the report as well as from other sources, a narrative designed to assist learners in drawing key lessons from the case, and developing supporting graphics. This case study will serve as a foundation for a series of posts over the next few weeks. The case will be presented in the following segments: Initial response and size-up, tactical operations, extreme fire behavior and firefighter rescue, water supply, and analysis of NIOSH recommendations. On February 29, 2008 Firefighter Brad Holmes and Lieutenant Scott King were assigned to perform primary search of Exposure Delta at a fire in a wood frame duplex in Grove City, PA. During their search, rapidly deteriorating conditions trapped the search crew. After being rescued by the Rapid Intervention Team, both members were transported to Pittsburgh’s Mercy Hospital Burn Unit. Firefighter Brad Holmes had burns over 75% of his body, and died from his injuries on March 5, 2008. Lieutenant King suffered less serious injuries and was treated and released. A 41 year old female occupant of the dwelling also died attempting to rescue a pet. 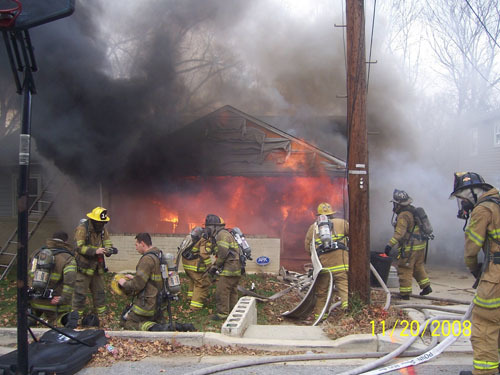 Note: Fire Department Photo – NIOSH Death in the Line of Duty Report F2008-6. This photo likely illustrates conditions after 0635 (approximately 19 minutes after arrival of the first fire unit, Chief 95). The fire originated in the D Side unit of a two-story, wood frame duplex at 132 Garden Avenue in Grove City, Pennsylvania. The building was originally built in the 1930s and remodeled into two separate dwelling units in the 1960s. As illustrated in Figures 2 and 3, the floor plan of each unit was a mirror image of the other. The first floor had a living room, dining room and kitchen and a deck on Side C. The units shared a common entry on Side A. The second floors had two bedrooms and a bathroom. The 36′ x 30′ structure was of balloon-frame construction and had a basement. Interior construction was plaster over wood lath with carpeting over hardwood floors. The unit on Side D (fire unit) had wood paneling throughout the first floor. Exterior construction was wood clapboards over wooden framing. The building was not insulated and did not contain a rated fire wall between the units. The roof covering was asphalt shingles over an undetermined type of wood sheathing. The initial call reporting this incident was 0606 hours, but was disconnected prior to communication of the nature of the emergency. A law enforcement unit was initially dispatched to the address to investigate the interrupted call. A second call was received from an occupant of the fire unit (Side D) at 0609 reporting the fire and that his wife was trapped. Station 95 (Chief 95, Accountability Officer (POV), Engine 95, Engine 85-2, Squad 95) and Ambulance 100 were dispatched at 0609 followed by Stations 85 (Engine 85, Engine 85-2, Squad 85) and 87 (Rescue 87) at 0611. The law enforcement officer initially dispatched to the disconnected call arrived at 0612 and reported a working fire with entrapment. Based on this report, the Station 95 Assistant Chief (unit not specified) requested an additional engine prior to arrival. Station 77 (Engine 77, Brush 77, and Water Tender 77) was dispatched at 0614. The temperature was 6o F (-14o C) with no wind. Chief 95 arrived at 0616 and established Command. Fire was showing from the first floor unit on Side D extension and there was significant involvement of Floor 2 of the same unit. The IC did a quick 360o size-up and determined the structure was a duplex by the two separate decks at the rear of the structure. However, this information was not communicated to the responding companies. The IC spoke to law enforcement and confirmed that there was an occupant trapped, but received no information about the occupant’s last known location. The following questions provide a basis for examining the first segment of this case study. While limited information is provided in the case, this is similar to an actual incident in that you seldom have all of the information you want. What building factors are likely to influence fire development and extension? What information should Command communicate to responding companies based on his size-up and assessment of the situation? What impact might weather conditions have on firefighting operations? Chief 95 was on-scene for four minutes prior to the arrival of the first arriving engine company. If you were Chief 95, what actions would you take during this time (and why)? As discussed in my posts on Outstanding Performance and Reading the Fire improving proficiency requires sustained deliberate practice! What additional information would you like to have? How could you obtain it? What state(s) of fire development is the fire likely to be in (incipient, growth, fully developed, or decay)? Remember that fire in adjacent compartments can be in a different stage of development? What burning regime is the fire in (fuel or ventilation controlled)? What conditions would you expect to find inside this building? Is this likely to be a survivable environment for unprotected occupants? For firefighters? Back the video up to the beginning, watch the first 15 seconds, and review your answers on the B-SAHF worksheet. Did any of your answers change based on the additional information provided by the view of Side A? After completing the B-SAHF exercise, view the remainder of the video. Did you successfully predict the fire behavior that occurred? This video provides excellent examples of smoke and air track indicators. However, sometimes the indicators of potential for extreme fire behavior might not be so obvious. Under these circumstances, you will need a higher level of skill to anticipate fire development. As Geoff Colvin emphasizes in Tallent is Overrated the quantity and quality of deliberate practice is the major determinant in expertise at all levels from novice to expert. Developing skill in reading the fire requires practice. Additional B-SAHF exercises will be posted on a regular basis at cfbt-us.com. Also check the CFBT-US Resources page for additional information on Reading the Fire! Consider making B-SAHF exercises a regular part of your training schedule. During a recent Compartment Fire Behavior Training (CFBT) Instructor course conducted at Tualatin Valley Fire & Rescue we used B-SAHF drills each morning to help the participants develop skill in reading the fire. However, these drills are equally appropriate for recruit firefighters. Understanding fire behavior and the ability to read the fire and anticipate changes in fire development are critical for everyone working on the fireground! Knowledge and skill are critical to safe and effective performance during emergency operations and firefighters and officers who perform well on the fireground are respected by their peers. What does it take to develop a high level of expertise? Believing that they are masters of their craft, some firefighters resist engaging in practice of basic skills such as door entry, nozzle technique, and hose handling (even when their demonstrated skill is far from proficiency). Others engage in this type of practice enthusiastically, serving as their own critic and identifying potential areas of improvement. In the fire service, years of service is often perceived as a measure of experience. But is this really true? In The Making of an Expert, Ericsson, Prietula, and Cokely (2007) observe that “living in a cave does not make you a geologist. Not all practice makes perfect”�. Developing proficiency requires deliberate practice that focuses not on specific areas in need of improvement or development of new knowledge and skill. Is Going to Fires Enough? Can a firefighter or fire officer develop the knowledge and skills necessary for a high level of performance on the fireground predominantly from going to fires? Actual performance is important, but it is not sufficient. Ericsson, Prietula, and Cokely (2007) use learning to play golf as an example of the need for deliberate practice. In the early stages of learning the game, players often begin by learning individual skills and then playing on the course. This generally leads to rapid development of a fundamental level of skill. However, additional time on the course will not necessarily lead to improved performance. Why? You don’t improve because when you are playing a game, you get only a single chance to make a shot from any given location. You don’t get to figure out how you can correct mistakes. If you were allowed to take five to ten shots from the exact same location on the course, you would bet more feedback on your technique and start to adjust your playing style to improve your control. Firefighting is similar, probationary firefighters spend considerable time practicing individual skills and learning to integrate them into the team context of company operations. However, after they leave the academy, how much time is spent in deliberate practice? Working on the fireground, you don’t get the opportunity for repetitive practice, and seldom have the opportunity to think about how to improve the effectiveness or efficiency of your work until after the fact. This often becomes even more difficult when individuals advance to the officer’s role. In his recent book Talent is Overrated: What Really Separates World-Class Performers from Everybody Else, Geoff Colvin (2008) explores the mystery of where great performance really comes from. This text provides a straightforward examination of current research on expertise the application of deliberate practice and examines how these concepts can be applied in a variety of contexts. Colvin (2008) identifies that deliberate practice may involve activities specifically focused on performance improvement and practice that is integrated with actual work performance. He describes direct practice using three types of activity as models, music, chess, and sports. In the music model, you practice application of the skill and receive immediate feedback from a teacher or by reviewing a recording (audio or video) of your performance. The chess model involves examination of prior performance by others (i.e., studying the games of chess grand masters). In other domains such as business and the law, this model involves the use of case studies. Effective performance may include both physical and mental elements. The sports model involves conditioning. This is readily applicable to physical skills, but applies to cognitive demands as well. Conditioning in this case may involve developing a deeper level of knowledge or use of simulations to practice decision skills. When applying the concept of deliberate practice to work activities it is important to identify your goals, what aspect of performance are you trying to improve. During work activity, pay attention to your performance. After the work feedback is critical. This may involve self-reflection, feedback from others, or preferably a combination of both. Each of these approaches has direct applicability to the fire service. However, it is necessary to approach deliberate practice in an intentional manner by identifying areas of performance that can be improved and developing a plan that includes direct practice and integrates practice and work activity. We can’t necessarily improve our performance without help. Even highly accomplished performers have teachers, coaches, or mentors to help design practice programs, provide feedback on performance and help maintain the motivation and commitment necessary to continued improvement. Teachers, coaches, and mentors are important to both individual and organizational performance. It is important to identify who will serve in this role as individual needs change and evolve as performance improves. What role do you serve; learner, coach, or (hopefully) both? Developing expertise takes time and effort. World class performers in most any discipline generally need a minimum of 10,000 hours of intense training and practice before reaching that level. There are no shortcuts! It is difficult to develop and maintain the motivation and commitment to sustain this level of effort. It is easy to look at our current performance level and think that we do quite well and take pride in our accomplishments. However, is this the best we can do? I would contend that good enough isn’t (good enough). The greater the time invested in deliberate practice, the greater the improvement in performance. Be a student of your craft, seek out feedback, and work diligently to improve your performance. Ericsson, A., Prietula, M., & Cokely, E. (2007, July-August). Harvard Business Review,, 85(7/8). Colvin, G. (2008). Talent is overrated: What really separates world-class performers from everybody else. New York: Penguin Group. Unfortunately this is rarely the case. Firefighters and fire officers often have limited experience and do not have sufficient understanding of fire dynamics to recognize potential for extreme fire behavior. Two firefighters from the Riverdale Volunteer Fire Department in Prince Georges County Maryland recently were surprised by a flashover in a small, single family dwelling. Probationary Firefighter Tony George captured initial operations in a series of four photos taken over a period of two minutes. In the first photo, firefighters from Engine 813 and Truck 807 prepare to make entry. Note that the front door is closed, the glass of the slider and windows are darkened, and smoke can be observed in the lower area of the front porch. What can be inferred from these observations? What is the stage of fire development and burning regime? Six seconds later it appears that the front door has been opened, flames are visible through the sliding glass door, and the volume of smoke in the area of the porch has increased. However, the smoke is not thick (optically dense). Has your perception of fire conditions changed? Why did fire conditions change after the door was opened? Forty eight seconds later, as the crew from Truck 807 makes entry to perform horizontal ventilation the volume of smoke from the front door increases and thickens (becomes more optically dense). The crew from Engine 813 experiences a burst hoseline, delaying fire attack. If the fire was ventilation controlled prior to opening the door, how are fire conditions likely to change? If the truck crew increases ventilation by opening windows, how will this influence fire development? What is the potential impact of the delay in deployment of a hoseline to attack the fire? Two minutes after the first photo, and shortly after the crew from Truck 807 made entry, flashover occurred. The engine from Riverdale Heights arrived first and advanced a hoseline to the front door and paused to don their personal protective equipment (PPE) and self contained breathing apparatus (SCBA). The house was vacant and a small fire could be seen in the front living room. The ladder truck from Riverdale Fire/EMS Station #807 was the second to arrive, almost at the same time as Riverdale Heights. The crew from Truck 807 donned their PPE and SCBA and entered the structure to begin ventilation by removing windows. As the engine crew from Riverdale Heights prepared to enter the structure and extinguish the fire their hoseline sustained damage from glass or debris and was cut; rendering it useless. As additional arriving firefighters stretched another hoseline into position, a flashover occurred. Two firefighters involved in this incident were seriously injured, FF Johnston was treated and released. FF Blazek was admitted to the MedStar Burn unit. Visit the Riverdale Volunteer Fire Department Web Site for updates on FF Blazek’s condition. Near misses and injuries such as occurred during this incident happen all too frequently. All too often, firefighters and officers consider this to be part of the job. Fire behavior is extremely predictable. It will do the same thing every single time under the same conditions. The problem is that the conditions are seldom exactly the same and our experienced judgment is not perfect. What can you do to reduce the risk of being surprised by extreme fire behavior? Become (or continue to be) a student of your craft and develop an improved understanding of fire dynamics and the influence of tactical operations on fire behavior. Practice reading the fire (see my earlier post Reading the Fire: B-SAHF) using photos, video, and every fire you respond to. A few days ago I watched a video clip of a fire officer performing a vent enter search (VES) operation on firevideo.net. Shortly after the officer made entry into the second floor, the room flashed over and he was forced to make emergency egress over a ladder. Yesterday, I came across the same video clip on vententersearch.com and saw that the Captain involved in the incident had posted his perspective on the event. There were quite a few posts related to this video and it took me a few minutes to find the Captain’s comments. Reading through the posts, I began to think about the nature and purpose of criticism. Some firefighters can be quite judgemental, particularly when commenting on decisions or actions taken by someone else. This is often painfully evident when reading comments on fire service blogs or forums. I frequently use video clips and written case studies as learning and instructional tools. Often, these involve mistakes or errors in judgment on the part of the participants. However, it is important to remember that it is quite different to sit around the coffee table or in a classroom and discuss an incident than it is to be faced with a parent screaming that their child is trapped on the second floor of a burning building. Firefighters and fire officers are faced with the need to rapidly assess the situation and make decisions under dynamic conditions and with limited information. Sometimes the outcome is good and in other cases, the outcome is injury or death in the line of duty. These injuries and deaths are unacceptable, but as long as humans are involved in fighting fires, we will occasionally make errors in judgement. The key is to work together to reduce the probability and frequency of these events. A critic is a person who offers reasoned judgment or analysis, value judgment, interpretation, or observation. While is it possible for a critic to agree with what is being criticized, the term is more frequently applied with someone who disagrees. Criticism can be constructive or destructive. Constructive criticism is compassionate and respectful. This is often the case when we receive useful feedback from a trusted colleague, friend, coach, or teacher. Constructive feedback is essential to participatory learning. Destructive criticism on the other hand serves to derogate and destroy someone’s work, reputation and self-esteem on whatever level it might be. Destructive criticism might be intentional or done out of ignorance and foolishness. When criticism is raised, some firefighters say if you weren’t there you have no room to comment (negatively) or take offense when questions are raised about the appropriateness of the actions taken by firefighters who have been injuured or died in the line-of-duty. I strongly disagree with this position. It is essential that we examine these events from a constructively critical perspective to identify the lessons learned. Decisions made under stress are influenced by many factors, including individual values, organizational culture, experience, training, and education. Photographs and video clips of fireground operations do not lay this foundation nor do they provide situational context such as reported information (e.g., persons trapped) or conditions outside the view of the camera. 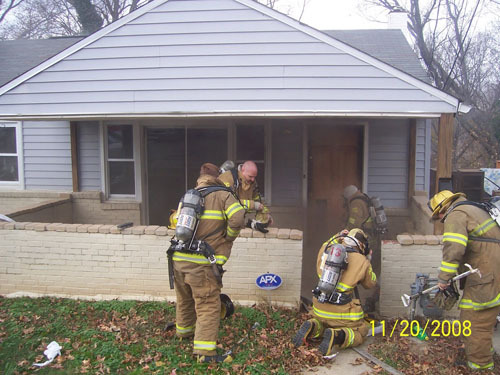 When using Vent, Enter, and Search (VES); firefighters make entry directly into threatened compartments from the exterior and isolate that compartment by closing the door and then conduct a primary search of that single compartment and exit throught the entry point/ventilation opening. This is a potentially high risk tactic that requires an ability to read the fire and experienced judgment related to both fire conditions and potential for rapid fire progression into the compartment to be searched. The following incident involved VES at a residential structure where rapid fire progress required the Captain conductin the search to perform emergency window egress from a second floor window onto a ladder. When I get to the window sill, the queen-sized bed is directly against the window wall, so there is no way to check the floor. Notice that you continue to see my feet going in, because I’m on the bed. When I reached the other side of the bed, I dropped to the floor and began trying to close the door. Unfortunately, due to debris on the floor, the door would not close. Conditions were still quite tenable at this point, but I knew with the amount of fire entering at the upper level, and smoke conditions changing, things were going to go south fast. All firefighting and rescue operations involve an inherent level of risk to firefighters. A basic level of risk is recognized and accepted, in a mesured and controlled manner, in efforts that are routinely employed to save lives and property. These risks are not acceptable in situations where there is no potential to save lives or property. A higher level of risk is acceptable only in situatios where there is a realistic potential to save known endangered lives. This elevated risk must be limited to operations that are specifically directed toward rescue and where there is a realistic potential to save the person(s) known to be in danger. In general, do you feel that VES an acceptable tactic when there are potentially savable lives? Why or why not? Would you have initiated VES operations in this situation? Why or why not? Based on conditions observed prior to entry, would you have committed to entering the room as Captain Van Sant did? Why or why not? If you were the firefighter on the ladder outside the window, what action would you take while your crew member conducted the search? The safety of firefighters or officers engaged in VES is dependent in part on the ability to close the door to the room being searched. This use of anti-ventilation changes the ventilation profile, permitting smoke to clear from the room, but reducing potential for fire exension into that compartment. In many cases this can be accomplished quickly, but in other situations the door cannot be closed (as occurred in this incident) or there may be no door present. If you encountered this situation, what action would you take? Under what circumstances would you discontinue the search to immediately exit the compartment? Entering a burning building to attempt a rescue takes courage. Not doing so, in the face of tremendous moral pressure when conditions and circumstances preclude savable lives also takes courage. Act on the basis of your knowledge, skill, and experience. This post continues my examination of fire stream effectiveness and efficiency with a look at factors influencing nozzle selection and a recap of factors influencing the effectiveness and efficiency of fire streams. 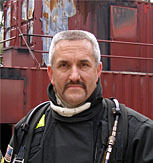 LT Bob Shovald’s article Improving Preconnect Function and Operation in the October issue of Fire Engineering magazine and FF Armand Guzzi’s article Analysis of Effective Fire Streams-Part I published on Firehouse.com advocated the use of high flow handlines equipped with low pressure nozzles. As pointed out in my previous posts It’s the GPM� and Choose Your Weapon: Part I, flow rate is critical and nozzle reaction is an important consideration, but there is a bit more to this puzzle. 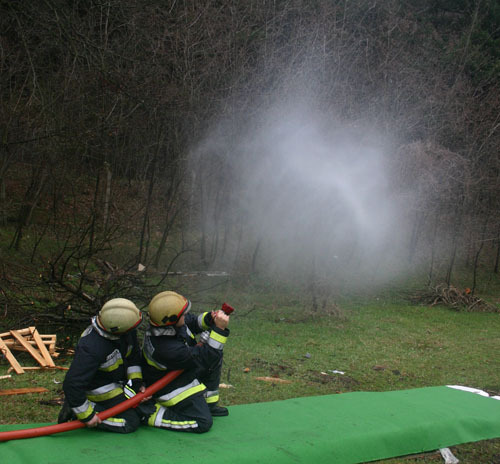 In the conclusion of his article, FF Guzzi states that “nozzle reaction should be a primary factor in determining what flows are needed by the department” [emphasis added]. I disagree. Heat release rate of the fire determines what flow rate is required. Nozzle reaction is one factor in determining the flow rate that a particular crew can deliver. LT Shovald and FF Guzzi place a high priority on low nozzle reaction in the selection of low pressure nozzles for handline operations. However, when gas cooling is used to address the three dimensional threat presented by the hot gas layer in a compartment fire, low pressure nozzles are considerably less effective and efficient than those using a higher pressure. As illustrated in the following photo, use of nozzles having a 100 psi (700 kPa) nozzle pressure results in small droplets (0.3 mm average diameter) that have excellent hang time allowing effective cooling of the hot gas layer. In addition, when adjusted to straight stream, these nozzles also provide effective penetration and reach within the context of offensive, interior firefighting operations. Good hose handling skills and nozzle technique allow a two person crew to work effectively with 1-3/4″� (45 mm) to 2″� (50 mm) handlines with flow rates up to 200 gpm (760 lpm) for offensive, interior firefighting operations (even with a nozzle pressure of 100 psi (700 kPa)). However, the flow rate required is often less than the upper end of the flow range. For example, when working in a compartmented residential fire, effective cooling of the hot gas layer can frequently be quite effectively accomplished with of a flow of 30 gpm (115 lpm) to 60 gpm (230 lpm). How can we address these diverse flow requirements during firefighting operations? Both variable flow and automatic nozzles can be used effectively to adjust flow rate based on tactical requirements. However, this task is accomplished through somewhat different methods. Automatic Nozzle: An automatic nozzle varies flow through a specified range using a variable orifice controlled by a spring to maintain nozzle pressure in a narrow range. For example, a nozzle such as the Task Force Tips mid-force nozzle has a flow range of 70 gpm (265 lpm) to 200 gpm (760 lpm). At 70 gpm (265 lpm) the nozzle pressure is approximately 85 psi (593 kPa). As flow increases towards the upper end of the flow range, the orifice size becomes larger and nozzle pressure increases slightly. 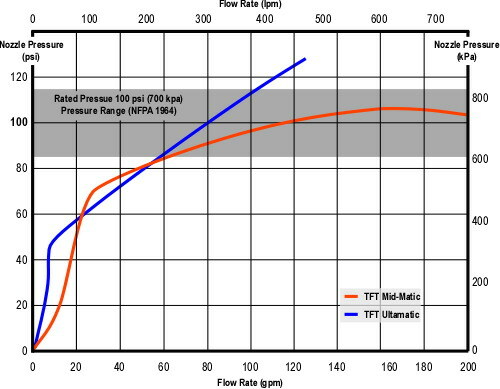 For example, at a nozzle pressure of approximately 110 psi (758 kPa) the TFT mid-force nozzle reaches its maximum designed flow of 200 gpm (760 lpm). The apparatus operator determines the maximum flow rate by setting the line pressure at the pump. The nozzle operator can achieve that flow rate by opening the nozzle fully or can use a lower flow rate (while still maintaining correct nozzle pressure) by only opening the nozzle part way. However, as illustrated in the preceding graph, the nozzle pressure at the lower end of the flow range is lower (with resulting larger droplet size). Performance of automatic nozzles is best when the nozzle pressure is at or above 100 psi. Variable Flow Nozzle: Variable flow nozzles also have a variable size orifice. However, with this type of nozzle changes in orifice size must be made manually. Most users don’t change the flow rate. However, pumping the line for the maximum desired flow and then reducing flow rate at the nozzle provides an excellent performance. Unlike the automatic, nozzle pressure does not remain the same when flow rate is reduced. Reducing flow rate while maintaining the same discharge pressure increases nozzle pressure. However, as flow rate is reduced, nozzle reaction does not increase (and in many cases is substantially less). This is because nozzle reaction is influenced to a far greater extent by flow rate than nozzle pressure. The other advantage of using this approach to flow control is that the lower flow rate (usually used for gas cooling) at higher nozzle pressure produces extremely small droplets which are highly efficient at absorbing energy in the hot gas layer. On the down side, variable flow nozzles are slightly more complex to operate as there is a separate control for flow rate. From the remotest periods of antiquity to the present time, the business of extinguishing fires has attracted a certain amount of attention; but is a most curious fact that, even now, there is so little method in it in that it is a very rare circumstance to find any two countries, or even any to cities in one country, adopting the same means, or calling their appliances by the same name. Each type of nozzle has different performance characteristics and will perform well under specific conditions and less optimally under others. Weight of the hoseline, flexibility, and nozzle reaction have significant impact on the effectiveness and efficiency of hoseline deployment. CFBT-US has been working on a glossary of terms that are important to CFBT Instructors and other students of fire behavior. This is a work in progress, but have a look and feel free to provide your input or feedback on what we have accomplished so far. A link to the is provided on the CFBT-US Resources page. In addition to the glossary, a link to the Fire Behavior Indicators Concept Map (version 5.2.1) has also been posted on the CFBT-US Resources” page.